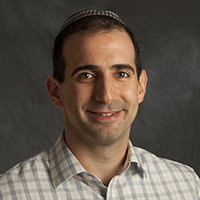 Dr. Joseph Angel specializes in the literary heritage of the Jews of the late Second Temple period and the significant role this corpus plays in the reconstruction of classical Judaism. He received his PhD from New York University, and he is the author of Otherworldly and Eschatological Priesthood in the Dead Sea Scrolls (Studies in the Texts of the Desert of Judah 86; Brill: Leiden, 2010), which explores the imaginative depictions of angelic and messianic priestly figures in the Dead Sea Scrolls as a reflection of the religious worldview of the Qumran community and related segments of Second Temple society. I was a graduate student in New York University’s Skirball Department of Hebrew and Judaic Studies, where I wrote a doctoral dissertation on conceptions of priesthood in the Dead Sea Scrolls. Interacting with students who are so profoundly devoted to Jewish tradition. It is especially gratifying when critical discussion of ancient Jewish sources leads students to reconceptualize and more deeply appreciate aspects of Jewish heritage that were already central to their lives. A medical doctor – I have always been fascinated by medicine. My principal goal as a scholar is to demonstrate how ancient Jewish sources (including both textual evidence and archaeological data) illuminate our understanding of continuity and change within Judaism from the Bible to the earliest Rabbinic writings. As a teacher, my goal is not simply to transmit information, but to identify and open up to students the various methods of critical analysis through which this information may be filtered. The ultimate hope is to foster an ownership of critical thinking and to bring about an intellectual growth that will enrich the student’s life enduringly. I am an avid classical flutist. I’ve performed in various groups and symphonies since I was 10.